The Clark Law Firm, PC is a prominent New Jersey personal injury law firm dedicated to mastering both the art and science of winning jury trials. 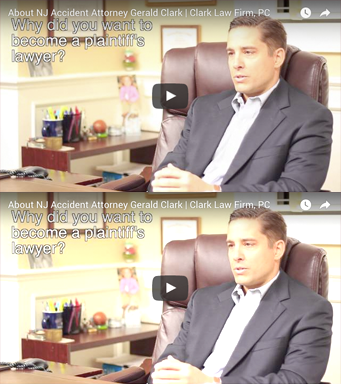 Gerald H. Clark is the Principal Attorney of the Clark Law Firm, and a Certified New Jersey Civil Trial Attorney by the Supreme Court of New Jersey, a professional distinction held by less than 2% of New Jersey attorneys. Clark has put together a team of talented attorneys and staff similarly devoted to excellence in representing people. The firm’s success has benefited its clients and the public at large. Through individual victories, we achieve a greater good for our communities and country. Our New Jersey personal injury law firm, based in Monmouth County, believes that trial lawyers have a crucial part to play in policing Corporate America – making sure that big business follows the same rules the rest of us live by. Juries as representatives of the community are an important check on government and corporate power. No one can put a corporation in jail, but a well-informed, motivated jury can take the profit out of breaking the rules. Whether your case involves workplace injuries, construction site accidents, insurance bad faith, catastrophic personal injury, (auto accidents, product liability and design defects), wrongful death or unfair commercial litigation practices, anywhere in the United States, Clark Law Firm, PC may be able to help. We bring a strong commitment to each case we accept. The Clark Law Firm handles all types of serious personal injury and accident cases. To find out how we can help you, call us at 1-877-841-8855. We welcome inquiries from potential clients and from other lawyers. Our legal fees are usually contingent. This means that there is no charge for our firm’s time until the case is successfully concluded. The Clark Law Firm has four offices to serve the entire state of New Jersey.